This week’s Virginia trout stocking schedule is below. The rains from the last couple days should be helping conditions. This is a neat little book, The Brook Trout and the Determined Angler. It’s something you might find on a musty bookshelf at your grandparents’ cabin in the woods. Royal Wulff. Looks like an alien, loved by trout everywhere. I don’t want to say that the Royal Wulff is the only fly you need to catch brook trout on mountain streams in the eastern United States. It’s not. 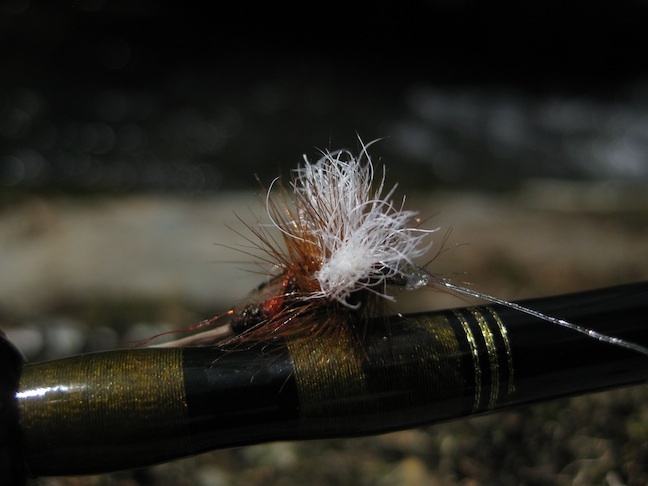 Some say other flies work better in certain situations and on certain streams. There are those who claim terrestrials are the only way in mid-summer. When hatches occur many insist matching the hatch is a must. When waters are raging nymphing could be your best bet. And so on. No doubt these are all valid views at various times. Sneaky anglers. Photo by Sandy Hays. 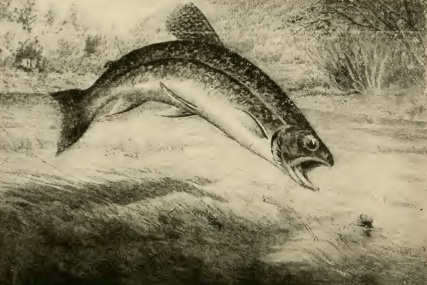 Wild trout are spooky. Everyone who fishes for them learns this, but sometimes the degree to which you have to be sneaky is much greater than you’d think. In certain conditions, especially in late summer when the water is low and clear, it is absolutely NOT crazy to have to crawl (on hands and knees and maybe on your belly) up to the spot where you’ll cast in order to avoid scattering the fish in that pool. For you and me, “invasive species” means rainbow trout. Rainbows stocked by the Virginia Department of Game and Inland Fisheries have established themselves in the lower reaches of many park streams. They out compete the native brook trout in most cases. We’ll have more on this in a subsequent post so stay tuned. Tenkara USA has an interesting post on sinking a fly. I like their keep-it-simple philosophy, no shot and no weighted flies. Sort of nymphing with a wet fly. That would certainly be good in a lot of situations. Another tip to keep in the back of the cluttered mind. Mending line, counteracting the effects of currents and drag — good stuff. Where I live, I can leave the house and be fly fishing for brook trout in as little as two hours. For me, this takes some planning. Sometimes I get the pack loaded and the gear sorted the night before, but even when I think everything is ready I’m still running around grabbing this and that when I should be leaving. As I am not one to plan anything unless forced to, it’s amazing that I ever get out there. It goes against my natural tendency to wing it. For brook trout fishing, though, I do it. Last week I posted what I have thought of as the “Thursday or Friday” fish stocking schedule. Maybe that’s because those are always the days I check the Virginia Department of Game and Inland Fisheries website. It’s clear that that this can actually be posted on the website just about any day of the week. Ooops and doh! Arsenic in poultry. I had no idea arsenic was added to chicken feed to treat intestinal illnesses. The gist of the article is that this stuff ends up not only in our own diet but in waterways and groundwater.